Sweets, which are filled with perfume and make your body smell, the U.S. company has developed a "Bennett" with Bulgarian candy factory "Alps", writes British newspaper "The Guardian". 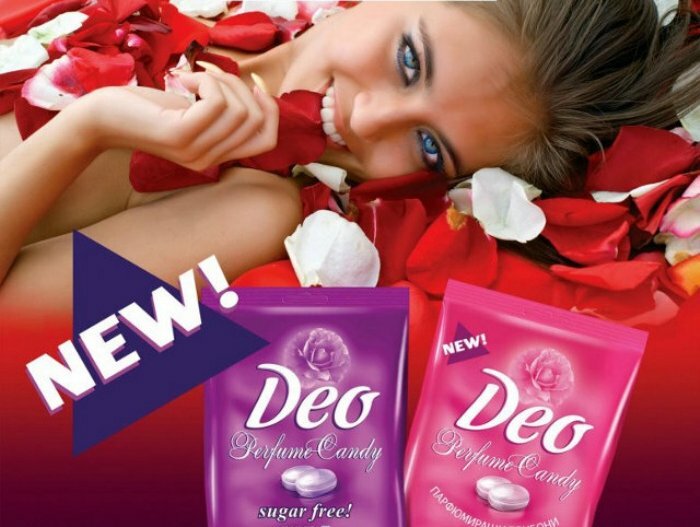 Candy is saying "Deo Perfume Candy" and then chew them, released through the pores of the skin scent of roses. Eating sweets, become walking flavoring and no longer have problems if your neighbor on the bus was not bathing newspaper said. Candy Deodorant operate on the same principle as garlic. Both foods contain substances that can not be digested by the body and therefore earn in human skin. When candy is the main ingredient geraniol - a substance that occurs naturally in plants such as rose, lavender and vanilla. Unusual cute are absolutely safe and American consumers eat them without a problem, since they were put up for sale online in August. Candy stores are already in Spain, Germany, China, Korea and Armenia. It will soon appear in the UK. There sweet perfume would be a different package and with modified scents that are suitable for Valentine's Day. Candy is part of a group of new products between food and cosmetics. Dutch company "perfume swallowing" is already developing a similar product that will not cake, but rather a cosmetic that is eaten. The idea is to produce capsules that will pump the sweat of man "unique flavors". The product is waiting for the market but only after 3-5 years. Munchkins perfumes are not a new discovery. Japanese researchers were the first to have shown the relationship between the absorption of geraniol and fragrant perfume of sweat, recalls, "The Guardian." A few years ago they released the gum "Men smell". The scent, which she filed, but only lasted an hour or two. Chew perfume, scented candy, edible deodorant, maybe deo perfume candy - also called another invention based Bulgarian rose oil, which is now plundering like hotcakes in Europe, Asia and the USA. Suffice it to scrunch a little candy in the next 6 hours your body begins to emit the scent of freshly torn fabric rose (Rosa damascena). Non-traditional perfume factory candy in Asenovgrad. "Within a few months, we won an enviable position in global markets", told Radio factory owner Wenceslas Peychev. For Deo candy alike spoke British newspaper "The Guardian" about his upcoming appearance on the British market in early February next year. The author of the article recommends it as an appropriate gift for Valentine's Day, enthusiastically exclaiming: "What more romantic than to combine the scent of a flower with that of a loved one". Interestingly, the Bulgarian invention actually works the same way as far as the fragrant garlic. Both foods contain substances that can not be digested by the body and therefore discarding the skin as a man sweat. The main "culprit" for the pleasant smell of the perfume is actually chew non-degradable ingredient geraniol. It occurs naturally in plants such as lavender, geranium, vanilla, but primarily in Bulgarian rose oil, which grows in abundance near Kazanlak. "With the help of experts from the University of Food Technologies in Plovdiv were able to isolate and to put into question geraniol composition of candy so he can keep longer their properties," said Wenceslas Peychev. The official "proshtapulnik" the Bulgarian invention took place last spring at the International Exhibition of innovations and inventions in Geneva, where he caused a furor and won the Certificate world innovation. The edible deodorant since enjoyed widespread acceptance in countries like Spain, Germany, France, China, Korea, Singapore, etc. In the U.S., yet the product is distributed on the Internet and costs 10 USD. e package. However, candy pink have become a hit there. In our sales are less, although in our retail chain price is about 10 times lower than in the U.S..
Bulgarian invention is part of a new trend that is developing around the world, including in Bulgaria, called nutrikozmetika and beauty by eating. So Assenovgradsko factory already has an idea to develop other unconventional beauty products. For example, a Collagen as yogurt or soups with collagen to help smooth wrinkles, we have quite strong effect. Manufacturers of edible deodorant ensure that it is 100% safe. Moreover, the information contained in it long geraniol was patented as a safe food product from the famous European company. Bulgarian producers prepare for the men who are afraid to exhale a delicate flower, fresh scent deodorant made in BG only for men. It will emit far less sweet notes, but what - so far kept secret. Would you eat the new sweet that's also a deodorant? 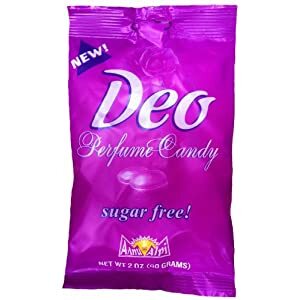 That's because I've been eating 'deodorant candy' — Deo Perfume ... 'The candies contain a chemical which is not broken down in the body.